I freely admit that I have never played a Professor Layton title, outside of preview events held at Nintendo Canada. How ironic that the first title that I played from this popular franchise is apparently its last, and the third part of a prequel trilogy. While this may cause me to lose some of the benefits of knowing how the puzzle system has kept players engaged over the years, or how the story got to the point where it is now, it did not stop me from enjoying the game, its story or the 100+ puzzles awaiting solution. The back story is easily picked up, but I do caution that Azran Legacy is reading-intensive, so I would not recommend this title for younger children, unless they have a very good command of the written word and a penchant for solving puzzles. Our lead character, Professor Layton, seems to me to be very similar to Sherlock Holmes – if he were a teacher – and not a drug user. He has endless patience and can turn any situation into an educational experience for his young apprentice Luke. In many ways, it is like the game’s writers and designers have plucked the characters and their world right out of Victorian England, relocating them into this interactive story – one which doesn’t hinge on having played the five previous titles to have an inkling of what is (or has) happened previously. 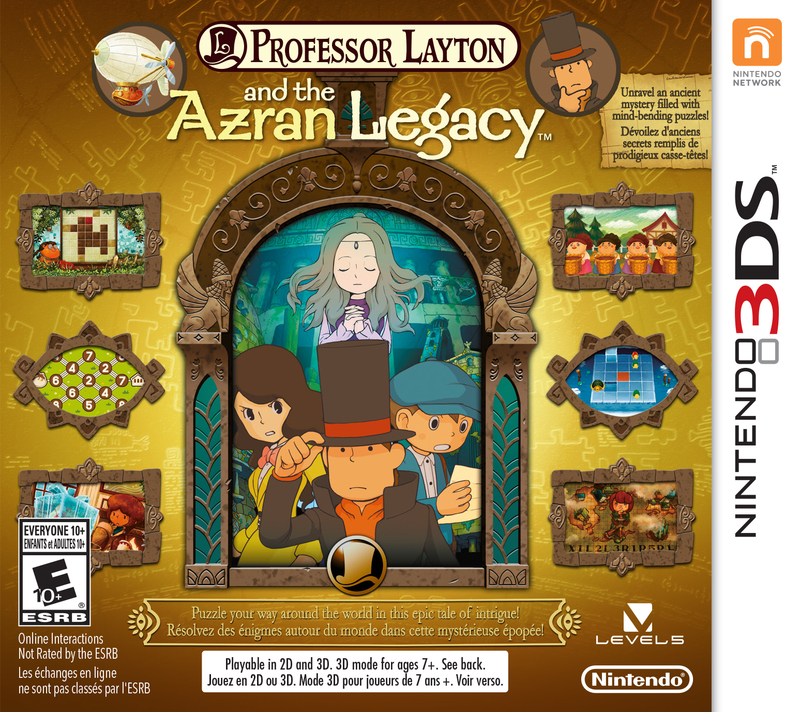 Professor Layton and the Azran Legacy is not a game to be rushed through, for there are coins and clues to find, people to talk to and mysteries to solve. While the game play tends to be somewhat linear – you need to visit Point A in order to get the information you need to get to Point B, there is a time later in the game where you can travel about as you want, revisiting places for missed hint coins or new clues. There are also bonuses and mini-games that can be unlocked, with the mini-games getting stored in the Professor’s travel trunk for re-play later. Collecting hint coins can be tantamount to solving some of the puzzles – which is a necessity if one wants to earn the Picarats rewarded with each successful puzzle solution. Be warned though – the Picarat payout decreases with each incorrect submission – and there is a limit to the number of hint coins to be found around the game’s world. Thankfully some of the puzzles also let you change your answer before you hit the Submit button – this can go quite a way to saving up your Picarats, which are needed to unlock bonuses. While the “ah-ha!” moments are great, sometimes getting to that moment can push one’s patience and at times walks the line between engaging play and turning off the game. Some of those puzzles are indeed challenging, and if one is not in the mood to figure out the logic behind Level 5’s challenges, there is a definite risk that the game will be put on a shelf to possibly be returned to at a much later date. There are a couple of saving graces regarding the puzzles, however. Not all of the puzzles need to be solved as you come across them. While new areas require a certain number of puzzles be solved, some puzzles can be put aside until later. During the course of the story you also acquire a puzzle-hoarding cat named Keats, who will hold incomplete puzzles for you. Instead of having to return to exact puzzle locales, you can just venture back to the airship and solve the puzzles while floating around in zeppelin luxury. For those who want even more puzzles to solve – once you’ve completed the game you can download daily puzzles to the Bonuses area. Azran Legacy is also Street and Spot Pass enabled, adding yet another layer to the game. The story itself, along with the three main characters, are well done, as are the cinematics and varied, non-intrusive soundtrack. There are so many things to look at in the game, and the animations add an extra depth to the story with details that while small on the very large scale of this 3DS game, helps with holding visual interest and the desire to discover new things (and more hint coins). The orchestration is well matched to what is happening on the screen, from jaunty travels to light conversation to danger-signaling ominousness. As I mentioned earlier, there are mini-games to unlock. These three mini-games are Nutty Roller, Bloom Burst and a snoozer of a game that involves giving fashion advice to various characters in the game. Both Nutty Roller and Bloom Burst are fun, but they ramp up quickly to become quite challenging. In Nutty Roller, you become a squirrel who is trying to roll nuts from one point to another, while in Bloom Burst you are a landscaper who tries to beautify the planet with exploding flowers. As with every game, there is the band of baddies, and its leader, Leon Bronev, along with his minions, does his best to stump and delay the Professor’s team with their puzzles. The prize in this game is figuring out the story behind the “living mummy” discovered by Professor Sycamore. Our team of heroes need to solve the mysteries and understand the messages left behind by a long-gone civilization in order to save humanity – and this can only be done by flying around the world in a giant airship and talking to some very strange looking citizens along the way. All in all, like any good story, Azran Legacy is not really meant to be completely gone through in one sitting. It is meant to be savoured like a favourite book, each chapter to be explored at length as you grow to become familiar with the nuances and quirks of each character while ferreting out the treasures hidden in each locale. Each explorable area of the game can be gone over with a magnifying glass that is manipulated with the 3DS’ stylus. What you find depends on the colour of the glass – orange or blue, and you never know where you might find a building to peer into or a Hint coin to hoard. Aside from the bane of my existence – math puzzles – I enjoyed my time with Professor Layton and his rag-tag band of adventurers. My score for this title is 4/5, and I hope that you will pick it up and journey out on your own adventure. This entry was posted on Sunday, March 9th, 2014 at 11:56 am and is filed under Everyone 10+, Game Reviews, National News, New Releases, Puzzle. You can follow any responses to this entry through the RSS 2.0 feed. You can leave a response, or trackback from your own site.